It hit me like a flash: all Japanese children speak Japanese! This thought struck me like a flash of light in a dark night. Since they all speak Japanese so easily and fluently, there must be a secret; and this must be training. Indeed, all children everywhere in the world are brought up by perfect educational method: their mother tongue. Why not apply this method to other faculties? I felt I had made a tremendous discovery. 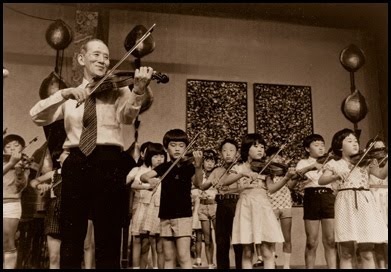 Suzuki emphasised starting violin lessons early. The first few years of life are when children learn the fastest and are able to absorb experiences the most easily. Traditional methods of music education wait until the child is able to demonstrate musical ability before starting music lessons. But is this how children learn to speak? If we look closely at the mother tongue model, we see that for the first year, children don’t demonstrate the language they are learning, they simply absorb it. And despite their infant’s obvious lack of speaking talent, parents continue to model language for them, and then subsequently applaud with wild praise every tiny step they make in the right direction. So this is how we teach music to the very young. We provide them with beautiful music right from the beginning. We involve them in music making activities and games and we encourage every step they make with love and praise. A seed is planted in the earth. We don’t see when the germination begins. …We have to wait patiently. …Suddenly a bud appears. What a joy and pleasure to watch it grow! At the same time the root, unseen in the ground, is getting stronger and has the power to produce a big, sturdy tree. I think this is a good analogy for one’s ability.